Inspired by Persian and Indian motifs, this elegent Ketuba is graced by the ancient pillars of plenty and lotus blossoms. A blessing for prosperity and fecundity to the bride and groom. 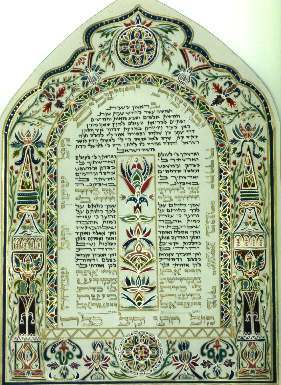 The text of the Ketuba is surrounded by the Hebrew words from the Prophet Isaiah; "There will yet be heard in the cities of Judea and the courtyards of Jerusalem the sound of joy, the sound of happiness, the voice of the groom and the voice of the bride."